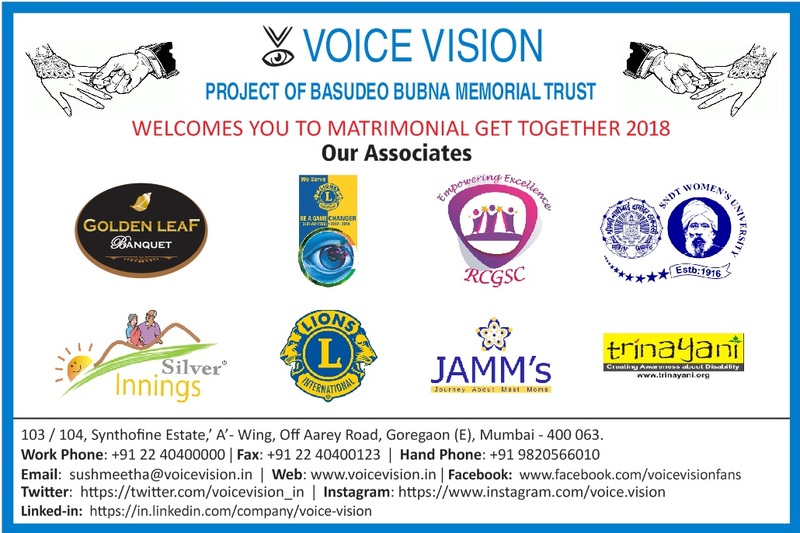 Believing in the concept “Match the capabilities, rather than matching disabilities”, we organized our 6th across disability matrimonial get-together on 25th February 2018 at Golden Leaf Banquet hall, Malad west, Mumbai. One hundred and sixty one prospects, ninety six men, sixty five women and their parents / escorts attended the get-together. Participants got themselves registered from 10:00 am onwards. All of them were greeted by sumptuous breakfast sponsored by Golden Leaf. Sushmeetha B. Bubna (Founder, Director – Voice Vision) commenced the day by welcoming all. She shared the schedule for the day along with few points to be considered while selecting their life partner which included values to consider, likes or dislikes of the other person and explaining that nothing happens in a single day, giving time to each other is important and that everyone has accepted their disability and overcome it. Mr. Rajit Mehra (Advisory Board Member) & Mrs. Spandana Mehta (Volunteer) then introduced each of the prospects one by one which made them comfortable. Saraf College Rotaractors and SNDT special educators helped participants to note down candidates’ names, whom they were interested to meet & interact; while the parents / escorts noted their own choices. Narendra and Tapasya (visually impaired) were present as the role couple for the event. They met each other at our get-together held on 25th February 2017. They consider this as the best moment of their lives. It was then time for the stirring part of the get-together. Each table had to share either advantages or disadvantages on a situation posed to them. Each one on the table had to contribute including participants, parents, escorts, special educators. Three situations discussing its pros & cons made everyone think. Outcomes on both sides of each situation were then shared with the entire audience. It was concluded that no situation is perfect, disability is in one’s mind and adjustments and adaptability can make things simpler. It also opened new horizons of approaching other disability and hope to find a suitable match. Subsequently came the most essential element of the event, interaction between the candidates over a lavish lunch. Most of the candidates got to meet with prospects of their interest. They had a comfortable chat and gained knowledge about each other. Many participants liked each other and were happy to take this connect ahead for further discussions. Rotaractors from Saraf College enabled smooth registrations and made the interaction for participants possible. The get-together concluded with felicitation of the venue & food sponsors, Rotaract Club of Saraf College, Silver Innings, Trinayani, JAMMs, Lions International District 3231/A3, SNDT Women’s University & volunteers. Followed by vote of thanks by Rtr Bhagyashree Tanwar & Rtr Akshita Jain. Our event expenses were sponsored by Lions Club International District 3231/A3 and all the newspaper advertisements were generously sponsored by District Governor Lion Mr. Sunil Patodia. We thank all the hundred and sixty-one prospects (comprising of visual, speech, hearing, polio, limb or other impairment) and their families who joined us from across the country, such as Ahemdabad, Bangalore, Kolkata, Delhi, Pune, Indore, Ratnagiri, other parts of Gujarat & Maharashtra for believing in the platform facilitated by us. We also thank Mr. Arpit Thakkar – Director Golden Leaf Banquet Hall for sponsoring the venue. Special thank you to Mr. Amit Sharma – Manager Golden Leaf for his generous support & coordination. 50 Rotaract Clubs across India have worked jointly to make it a Mega Joint Project in the Golden Jubilee Year of Rotaract Movement. Special thanks to Mr. Sunil Patodia, District Governor Lions International 3231/A3, all the volunteers, Rotaractors from Rotaract Club of Saraf College and 50 other clubs of RID 3141 & volunteers of NMIMS College, Silver Innings, JAMM’s, SNDT Women’s University, Trinayani, Ascent Networks Pvt. Ltd. To support the idea & set it rolling. Special gratitude to Media for enabling us to create awareness & widen our reach.